A dinner party is not a dinner party without a soup. I LOVE soup, and if I weren't so lazy, I could happily eat tasty homemade soup every day for the rest of my life. So of course, when I was doing up the menu for my dinner party on Saturday, I HAD to have a soup. Yummy, yummy soupiness. I came across this recipe on Chowhound and thought that it might be rather tasty. 1. Heat the olive oil and butter in a large saucepan over medium heat. When the butter melts and foams, add the leek and season with salt and freshly ground pepper. Cook, stirring occasionally, until leeks are softened but not completely cooked, about 3 minutes. 3. Add the cauliflower, stir, and cook for about 1 minute. Add the stock and crushed saffron threads. Bring to a simmer, reduce heat to medium low, and cook until vegetables are completely tender, about 8 to 9 minutes (due to inattention, mine probably bubbled away for 30 minutes or so). So, hubs still hates beets, and I'm still in LOVE with their fuschia brilliance. Not so much in love with their awe-inspiring ability to dye me pink, but still...you gotta admire something that has that much natural power. I *really* think this recipe would benefit from either the use of a mandoline or someone with far superior chopping skills...I did my best, but my slices weren't really thin enough to get crispy. They still worked pretty well though - and when you stirred them into the soup, they added a lovely touch of pink. 2. In a small saucepan, heat oil to 375°F. (The oil should be a depth of about 1/2 inch.) 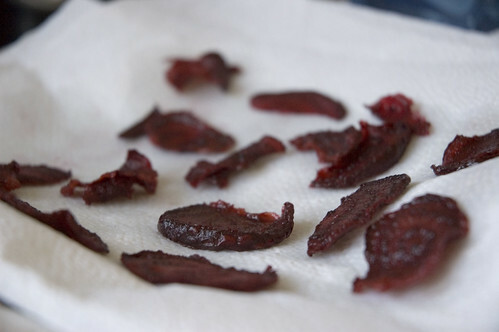 Add several beet slices and fry for about 30 to 45 seconds, shaking the pan a little. 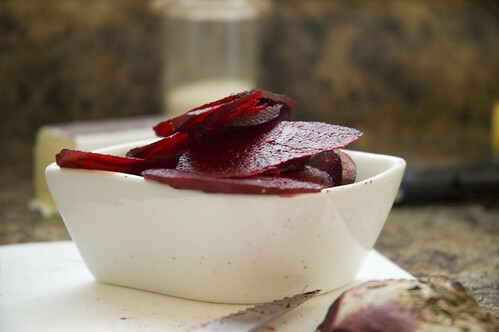 Remove beets from oil with a slotted spoon and place on a plate lined with paper towels. Sprinkle with salt. Repeat with remaining beet slices. Here are my beet slices afterward....decidedly mushy, but still kinda pretty, no? 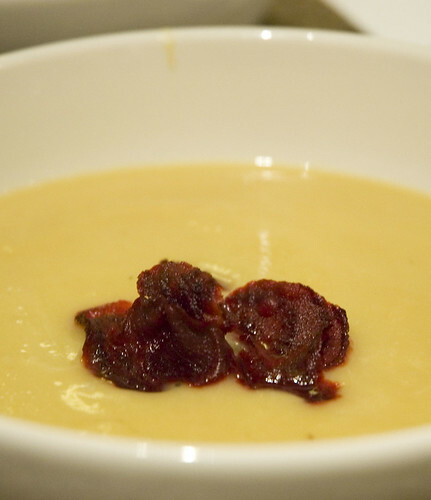 Serve soup topped with beet chips. I almost think it would work better to julienne the raw beet and kinda stack it on top...it would be just as pretty, but less work! Overall though, this wasn't the most amazing soup I've ever had - it was definitely decent, but could have used more seasoning....I initially thought to add some of my beloved smoked paprika (which would have been great), but since I've added it two my last couple soups, I thought I would step out of my newfound comfort zone.